Can you steam clean carpets? Yes. Whenever you want to clean a large carpet area in your house, consider using a dedicated carpet cleaner. This is because they are specially designed to extract embedded dirt that are deep within the fibre without having to use high temperatures. The steam cleaners are also very efficient and quick whenever you want to clean large areas. They can also be effective whenever you are spot cleaning the smaller areas of your rugs and carpet. You should, however, keep in mind that not all carpet types are suitable for cleaning using high temperature. For this reason, always test a small hidden area of your carpet before you clean it with a steamer. Most steam mops have a special carpet attachment that is also used for cleaning carpets once its large cloth is attached. A small cloth with the upholstery tool can also be used to clean your carpets if you have the hand-held steamer. To avoid your carpet holding down or even over wetting one area of your carpet, it is advisable to keep moving the tool across your carpet. All of the best carpet steam cleaners covered in this article have a carpet glider for refreshing carpet. You can either choose the Vax steam fresh combi, Morphy Richards 15 in 1, X5 Mop, Shark or even the Vileda mop. 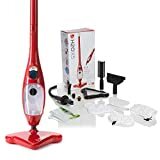 The H2O X5 Mop 5 in 1 Portable Steam Mop Multi Purpose Floor Steam Cleaner that can clean all kinds of sealed floors, carpets, windows , garments steamer and upholstery cleaner. It quite multi purpose and can clean ovens, hobs, kitchen top and cabinets and a host of places in your home. The Thane steam mop 5 in 1 (Red) is a standing steam mop with a removable handheld cleaner. It is quite efficient, versatile and reliable. It is powered by a 1300 watt motor that heats up in 30 seconds to give you up to 30 minutes of uninterrupted cleaning on a full water tank. The tank has a capacity of 400ml and it is quite lightweight; it weighs only 2.5 Kgs. The x5 mop as it is also referred to, has cool features like a 180 degree swivel steer technology and a triangular floorhead design that easily reaches corners to battle grime and dirt. It also has four variable steam control settings which mean you can vary the steam produced across your different floor types. It is quite ideal for linoleum and vinyl flooring. The H20 steam cleaner 5 in 1 has a 6 meter cable cord for easy reach to different parts of your house. The Thane h20 steam cleaner comes with a number of accessories that really turn it into a home cleaning system. With the accessories you can clean car alloy wheels, toilet rips, tap and sink crevices, grout and even shower cubicle. After a number of cleans, most of your surfaces will look like new. It is no wonder that in the year 2014; the x5 steam cleaner was awarded the product of the year. It has also received several awards by Which? and Good House Keeping which are industry benchmarks in consumer research. 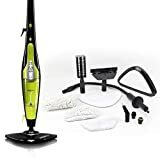 This 5 in 1 steamer is at the time of writing one of the best steam cleaner at Amazon UK with a solid 4.4 star rating out of the maximum 5 stars from 160 customer reviews. The Shark Lift-Away Professional Steam Pocket Mop S3901 is another top of the range best carpet steam cleaner. The Shark Lift Away runs on a 1550 watt that heats the 300 ml water tank really quick (30 seconds) to give jetting steam that can clean for at least 15 minutes. It has a dual mop head which means you can flip the mop head for double cleaning. It comes with an array of accessories that can be used to clean windows, upholstery, mattress, oven, hobs, Kitchen hood, shower cubical, grouting and all types of sealed hard floors. It also has a carpet glider. It has a long power cord (7.5 m), 180 degree swivel steer head and dries floor in less than 3 minutes after cleaning. The Shark lift away is one of the top rated steam cleaners in the cleaning industry. 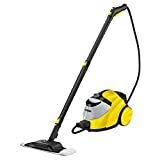 Key Features The Shark Lift Away 5 in 1 Steam Cleaner has a clever variable steam control function with three settings: dusting, scrubbing and mopping. The dusting function is for delicate floor types like laminate while the scrubbing is for tough stains. It is sturdy and quite versatile. This steam cleaner has also received a number of awards by top research companies like Good housekeeping for its qualities. No doubt this is a high pedigree steam cleaner that has a high rating of 4.1 star rating out of the 5 stars. The Karcher SC5 is a high end gadget that produces high pressure bar of 4.2 bar. It is powered by a 2200 watt that heats up the 1.5 litre tank in three minutes. It features a non-stop refillable tank and an assortment of Karcher comfort plus tools. It weighs 6 kgs and has a Vapa-hydro functionality that blasts out hot vapour to dismantle and breakdown any stubborn grime or grease. The gadgets come with a nylon round brush set of three colour coded brushes that are used to clean taps, grouting, crevices, bathroom, kitchen and many more areas in your domestic space. Terry clothes for wiping places you have cleaned. The terry clothes are machine washable however you are better off getting Velcro which tends to last longer. The few disadvantages about Karcher steam cleaners is that they typically have shorter power cords of 4-5 meters. This is unlike Vax that have long cables of 7-8 metres. The round nylon brushes for detail cleaning are not very durable. However you can buy brass bristle round brushes from Karcher from Amazon or any other online shop for less than ten quid. The brass bristle brushes are sturdy and long lasting. They are ideal for steam cleaning grout and crevices. a see-though high definition clean water tank to monitor your water tank level. Cons The manufacturers of X5 mop only give one year guarantee unlike other popular brand like Vax and Karcher that give two years manufacturer guarantee. The H20 steam mop is quite swanky but not very expensive (less than £100). It is one of the best multi purpose steamer that has been very well received by UK customers. The Hoover Steamjet, SNN1700 steam mop that has a nifty detachable handheld cleaner and a7 metre electricity cable cord. Enough length to reach most standard rooms. It has both rectangular and triangular floor head (double head technology). The triangular head makes you to easily access hard to reach areas like corners, table legs and tight spaces beneath furniture. It also has a scrubber on the floor head to aid you tackle tough and ingrained dirt. It has a versatile variable control that can be adjusted to regulate the steam released to your floors. It is suitable for all sealed hardwood floors.